On this date in 1639, the Duke of Valette was beheaded in Paris as a traitor. Having anticipated this cruel stroke, however, he was happily away in England at the time. Valette (later the Duke of Epernon, like his dad) outlived his execution by 22 years. 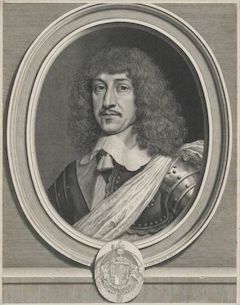 Valette’s military reversal at the French Siege of Fuenterrabia in 1638 set him up for the revenge of his scheming in-law. Blamed for refusing to lead an ill-conceived charge, he got the Iraq War critic treatment when that charge turned into a debacle as he had warned. But rather than face Richelieu’s summons to answer a charge he obviously had no odds of defeating, Valette crossed the channel and chilled in the exile court of another defeated Richelieu foe, Marie de’ Medici. “The Cardinal de Richelieu not contented with his having left the Kingdom, caus’d a Process to be commenc’d against him,” outrageously fixing the verdict. Just as Valette lost his head only ceremonially, he lost his homeland only temporarily. When Louis XIII died in 1643, Valette — by this time become the Duke of Epernon — was able to return and re-enter the ranks of respectable nobility, unimperiled by the headsman’s blade for the remainder of his days. He died in 1661. Their crime, per the Inquisition, was Judaizing — but we might better consider it today in the vein of terrorism, an idee fixe crawling from a swamp of public insecurities both real and projected: race, religion, geopolitics, and crass opportunism all vying for precedence under the Inquisitor’s cowl. This post will speak of “Jews” but it’s important to remember that the Spanish empire at this point officially had no Jews: it had forced its Jewish population into exile or conversion. That latter set, Jews who had converted to Christianity under that very Catholic realm’s pressure, thereafter became suspected down the generations of sustaining their Hebraic rites in secret, sapping the Church from within while looking for the odd opportunity to sacrifice a Christian child. It is uncertain in the end in what proportions these forced converts and their descendants did maintain Jewish devotions versus absorbing themselves into Christianity. But by whatever opinion, these are our “Jews”, conflating as the word often does both faith and race; the terms “New Christians” or “conversos” or “crypto-Jews” are also widely used in the literature and all refer to the same universe of suspected and former (at least somewhere up the family tree) Jews who presented themselves publicly as Christians. No matter the loyalty of individual converso, the suspicion each was born under placed them in an obvious practical difficulty, and it was compounded in the 17th century as Jewry, that eternal bugbear, also came to stand in for a host of other worries dogging the Spanish state. Spain’s rival on the Caribbean coast was its very own disobedient former possession, the Netherlands, and the latter offered Jews a liberal grant of toleration. Spanish conversos’ loyalty to their own crown, already doubted on principle, was doubly suspect for the proximity of rival settlements with unconcealed synagogues — no mere paranoid fantasy, as Jews on Spanish soil were prominent among the collaborators who aided Dutch incursions in the 17th century. Jews also came to be credited more generally with a scary affinity for the subject populations of conquered Indians and imported African slaves — their pagan magicks, their inscrutable tongues, and their frightful potential for revolt. And of course, there was all that odious money-handling. Commerce is cutthroat, and the evident power of Jews among the colonies’ emerging mercantile elites — and not just in Lima, but in Cartagena, Buenos Aires, and elsewhere — seems to have co-evolved with appeals from New World Castilians for the Inquisition’s scrutiny of this potentially disloyal element. Strictly out of piety and patriotism, you understand. 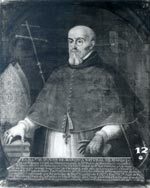 Juan de Manozca became Archbishop of Mexico in 1643. The arrival from Cartagena of Inquisitor Juan de Manozca, who had prosecuted crypto-Jews in that city as well as native “witches”, set the scene for one of the Spanish colonies’ bloodiest purges. In 1635, a great wave of arrests seized upwards of 100 of these “Portuguese” for La Complidad Grande, a supposed grand conspiracy among the heretics whose contours are little described in the documentation that survives for us. Was the “conspiracy” essentially Judaism itself? Or did Inquisitors perceive a more daring and tangible plot? “Apropos of the famous auto de fe of the Portuguese, Pelliza y Tovar, the famous chronicler of Aragon, says that on the day the Spanish authorities took possession of the letters and correspondence of the resident Portuguese they found keys and letters in code and they discovered that the synagogues of America were in intimate relations with the Jews of Holland.”† Manozca apparently communicated to the mother country that the Hebrews were stockpiling munitions. Francisco Maldonado da Silva, a Jewish physician who had been imprisoned since 1627 for returning to Judaism, and been completely unapologetic about it, even evangelizing other prisoners held near him. “This is the doing of the Lord God of Israel, so that I may now look upon Him face to face,” he said at the stake. This purge devastated not only New Spain’s Jewish populace but her economy too; with many of the wealthiest magnates clapped in irons from 1635 and their assets suddenly demobilized, other operators be they ever so devout immediately faced an epidemic of financial reversals and bankruptcies. * Even though a Portuguese Inquisition also existed, predating the 1580 union of the two realms. † The comment is that of Peruvian historian Ricardo Palma, quoted by Seymour Liebman in “The Great Conspiracy in Peru,” The Americas, October 1971. ‡ For a detailed exposition of Perez’s career in slaving, see From Capture to Sale: The Portuguese Slave Trade to Spanish South America in the Early Seveacnteenth Century.